Long before Orange is the New Black, there was the original Crazy Eyes- Norma Desmond. As depicted in this week’s Cinema Sips film Sunset Boulevard (DVD/Download), she really was the benchmark against which crazy should be measured. It wasn’t only her eyes; this lady dressed up like Charlie Chaplin, played poker with Buster Keaton, hired silent film director Erich Von Stroheim to be her butler, and held a funeral for her pet monkey. I know Halloween has been over for weeks, but I couldn’t resist one more ghoulish picture. This is a Hollywood horror story for the ages, and absolutely one of the greatest films ever made. 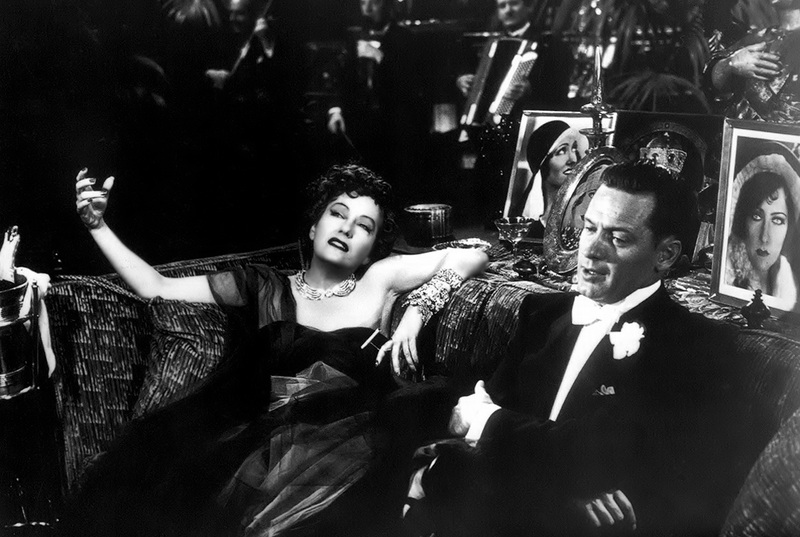 Released in 1959, Sunset Boulevard was written and directed by Billy Wilder. In a deliciously meta twist, it stars former silent movie star Gloria Swanson as former silent movie star Norma Desmond, an actress who was wildly popular during the 1920’s, but could never quite make the leap to talking pictures. This was the unfortunate case with many silent-era stars (ie. Mary Pickford and Clara Bow), and it’s been said that the character of Norma is an amalgam of many real-life actresses from the time. Struggling screenwriter Joe Gillis (played by William Holden) stumbles into her time capsule of a mansion (which bears striking resemblance to Disney World’s Tower of Terror), and because he’s flat broke, he agrees to move in and help her with a terrible screenplay that she thinks will be the start of her career renaissance. Eventually, improbably, they form a romantic relationship, and things pretty much unravel from there. For my cocktail this week, I’m paying homage to one of the great cinematic funeral scenes. No, I’m not talking about (SPOILER ALERT) Joe Gillis facedown in the pool with a few bullet holes. I’m of course referencing Norma Desmond’s other poor dead companion. Like Michael Jackson, this looney woman has an unhealthy relationship with her pet monkey and upon his death, decides to give him a proper wake in her bedroom. When Joe Gillis stumbles into her mansion in the middle of the afternoon, I’m sure a dead monkey was the last thing he expected to see. Thus this week, my cocktail has to be that old Hemingway favorite, Death in the Afternoon. 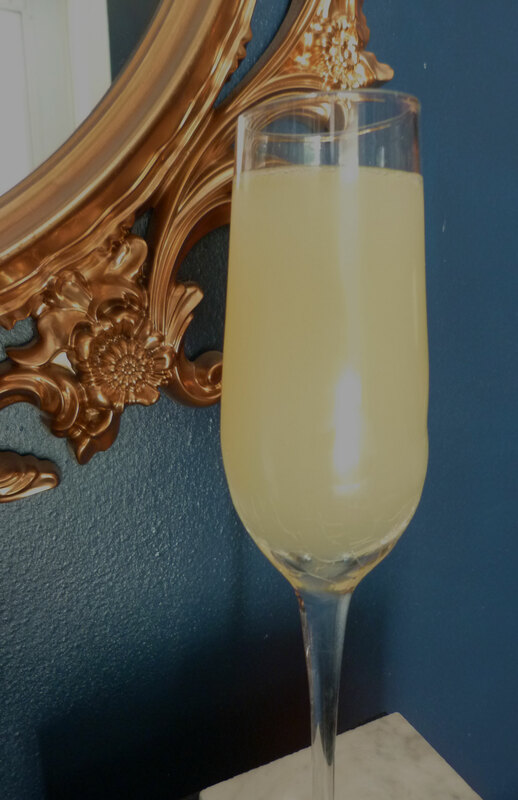 Pour absinthe into the bottom of a champagne flute, then slowly pour the champagne over it. The mixture will emulsify, forming a cloudy liquid. There are so many wonderful, quote-able lines in this film, but I think my favorite has to be “I am big. It’s the pictures that got small.” This really is an unfortunate truth about Hollywood these days. I’m hard-pressed to think of a movie star that is as big as say Mary Pickford once was, and I could name about ten films just in 2014 alone that to me signal the apocalypse of the film industry (Teenage Mutant Ninja Turtles, anyone?). Sure there are still great films being made, but every year it seems like they are fewer and farther between. Particularly when you hold up a blockbuster, or even Oscar contender from today’s era next to this genius script by Wilder, they seem so, so small. So follow my lead and enjoy a truly classic film noir with your Death in the Afternoon, and get ready for that close-up. Cheers! (For an extra treat, visit the Cinema Sips Facebook page for a great clip of Kristen Wiig as Norma Desmond, posted on Halloween. I died laughing). Posted in Classic Films and tagged Absinthe, Billy Wilder, Death in the Afternoon Cocktail, Gloria Swanson, Hemingway, Kristen Wigg, Norma Desmond, Sunset Blvd, Sunset Boulevard, William Holden. Bookmark the permalink. What do you get when you cross two burly jazz musicians in drag, a blonde ukulele-playing starlet, a hot water bottle full of whiskey, and a room full of tommy-gun toting gangsters? A heck of a good time, that’s what. 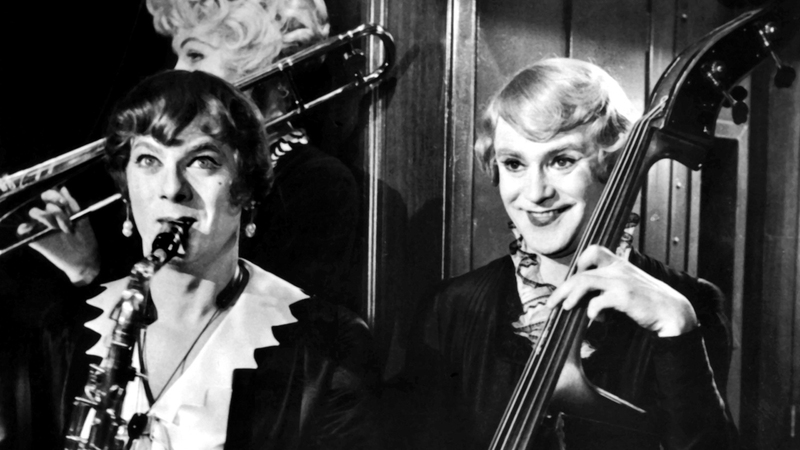 This week’s film selection is the 1959 Billy Wilder classic Some Like it Hot. Set against the backdrop of the roaring 20’s, this film features Jack Lemmon and Tony Curtis as two Chicago jazz musicians down on their luck and on the run from the mob. They hear of a female band in need of new members, so these two bosom buddies trade in their overcoats for dresses and wigs, and hop a train to Florida. On board, they meet Marilyn Monroe’s character Sugar Kane, and the rest of Sweet Sue’s Society Syncopators. These ladies like to party, and pretty soon the drunken shenanigans are off and running. Probably my favorite scene in the film is one that lends itself well to this week’s cocktail selection. During the train ride down to Florida, Sugar Kane gets the party started in Jack Lemmon (aka Daphne)’s bunk. He provides the whiskey, she chips some ice off an ENORMOUS block (did all trains carry polar ice down to Florida back then? ), and pretty soon the rest of the Syncopators have gathered in his bunk with a bottle of Vermouth and a pretty ingenious hot water bottle/cocktail shaker-thing. Manhattans are served in Dixie cups, and someone manages to produce some Saltine crackers (I don’t think I want to know from where). It becomes kind of a naughty sorority party, with Jack Lemmon in the center as the ugliest sorority sister I have ever seen. Zowie! While I’m watching this scene, of course all I want is a Manhattan so I can join in the party too. While I’ve typically posted cutesy variations on classic cocktails thus far, this week I’m going with something more traditional since this is such a classic comedic film. This week’s cocktail: The Classic Manhattan. Combine the rye, vermouth, and bitters in a mixing glass, fill with ice, and stir until cold. Strain into a chilled glass, garnish with the cherry or orange twist. If you’re like me, one of these is all you need for sipping during the movie. But of course it’s more fun to invite some friends over, make a big batch, and laugh at Tony Curtis’ faux-Cary Grant accent midway through the film together. This is truly a film that encourages celebrating music, friendship, cocktails and womanhood. And if you’re not a woman, well, nobody’s perfect. Cheers! Posted in Classic Films and tagged Billy Wilder, Jack Lemmon, Jazz, Manhattan Cocktail, Marilyn Monroe, Some Like it Hot, Tony Curtis. Bookmark the permalink.